What is happening with TreeSync®? I heard it has been discontinued. I have finally resolved a long standing email issue, when comments are made on this blog. I have followed all of the steps on various Google and Facebook Groups about this specific issue, many other Bloggers have reported the same problem. The cause of the problem was known and we know when it happened. The "help" instructions were many, and were the same solution, but did not work for this blog. I worked with a friend who had a working blog, and the Notification about a Comment being made was received. We compared settings. After comparing one setting today, I found the problem, and it has been resolved. I just published a number of Comments that were in Cue to be published and responded to each of them, except the dozen Spam comments. I am sorry for the delay in having those comments published, but they are now active and I have responded to them. WANT TO LEARN MORE ABOUT FTM 2017? Compare Features. Check out a comparison chart of older FTM versions vs. the latest one. Get the What's New List. You can read What's New in FTM 2017 in our Support Center. Read an FAQ. You can check out Frequently Asked Questions about FTM 2017 online. I have both a brother and a sister as direct ancestors of the home person. The program defaulted to the brother with the yellow arrow because he is a 5th great grandparent while the sister is a 6th great grandparent. How can I make both of them as direct great grandparents. With this problem I am unable to do a mtDNA chart of mother to daughter etc. If you have the relationship correct, they both will appear as "direct" Great Grandparents. An Quick Check go to the "Brother" in the People Workspace, Person View, in the right panel, is the Relationship to the Home Person correct? Repeat the same for the Sister, ans is that correct. I am guessing that is how you saw the 5th Great Grandparent (father) and 6th Great Grandmother information came from. You can versify this when you go to the Tools Menu, Relationship Calculator, starting with yourself as the selected person, (top field) and the "brother" in the 2nd position, and see what the Relationship is between your self and the brother. Then change the brother to the "sister" and make sure that this relationship is what you expect. 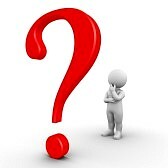 A hint may be that when you look at the Relationship field, there may be a (#) after the word Relationship, indicating that there may be more than one relationship going on. Looking at my own database, I have two brothers that are 7th great grandfathers, both brothers have the "yellow arrow" that you mentioned. That makes me think, that in your case, you are not seeing the 2nd "yellow arrow". On the surface, this sounds like a data entry / relationship issue within your database. I looked to see if I had situation like you described and I don't. Family Tree Maker (FTM2017) has an interface to the FamilySearch.org website. Will Software MacKiev be supporting FamilySearch? Where should FTM users go for technical support? The Family Book Creator is a Plug-in for Family Tree Maker. What about the Family Book Creator plugin by Stefan Harms? Is it compatible with the new versions? A person has multiple parents listed, natural parent (not married), adopted parents, [no spouse entered]. [no spouse entered] is listed for both father and mother. Because of this when I try to show the person's tree no ancestors appear. I do not know how to fix this? In the Search Box, upper Left, enter "No Spouse Entered". I have already blogged about that. Software MacKiev versions of Family Tree Maker? Do I need to re-register with Software MacKiev? I already own a Software MacKiev edition. Do I need to get FTM 2017? will I need to install my old FTM copy on the new computer before upgrading? I own an older version of Family Tree Maker. Can I get a discount on an upgrade? I've installed a new Software MacKiev version. Do I need to keep the old version? Stefan Harms? Is it compatible with the new versions? Where is Family Tree Maker sold? Will versions of Family Tree Maker be available in other languages? This blog post is a result of reading Tony Proctor's Parallax View, A different view on things, titled The Future of Online Trees. His blog got me to think about what I might do when linking my Family Blog posts into Family Tree Maker. This video are my thoughts on how I am linking my blog posts into my database.. I will gather articles based on the seven (7) Workspaces, Offer the Article and a Link to that Article. There probably will be some other categories, not specific to a Workspace, that I will also offer. I will probably offer about 5 articles per blog post, but if I find other articles in that same Workspace, I'll update the blog post (creating a NEW blog post, but mark is as an Update) where I will add new articles that I found. I will also attempt to show the Date of the Article. In other words, I am hoping to build a Directory of articles, by workspace, written by Software MacKiev about the Family Tree Maker Program. Since my blog posts are by Workspace, down the Left Column and the Search box in the Upper Left, you will be able to find My Blog Posts about that Workspace, as well as the Directory of Articles, hopefully, will help find information a little easier. My blog posts are about how I use the program, and that changes over time, but I want the readers to be able to find what the good folks at Family Tree Maker have to say. Within the Family Tree Maker program there two major types of Back Ups, the Automatic Back Up and the Manual Back Up. 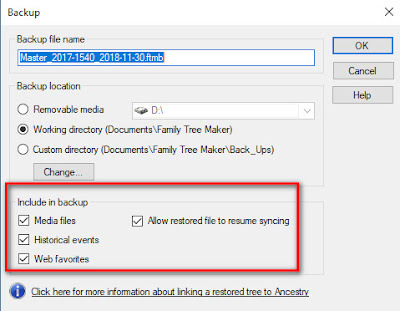 I am mentioned this, with my recent posts about the naming of our Media Files to hi-light the differences between your Back Ups and how you include your Media and other files into Family Tree Maker. Here is an example of How and Where I same my genealogy files BEFORE I add them to my FTM2017 file. 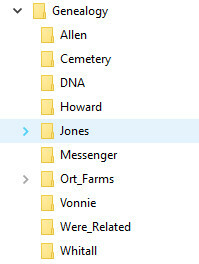 The files in these folders may or may not be included in my database yet. They may be Documents, Images, other Media Files, but fielded by Surname, so I can find them again. When you Add a file, into Family Tree Maker, you use the ADD button, in many places within toe program, either to a Person or a Citation. My previous Filenaming blog posts have been with those Media files, linked to Citations. My goal is to have a Citation on ALL Media files, so that I know where I got "that file" from. This happens to be in the Media Workspace, but there are many places where to add a Media file into the program. 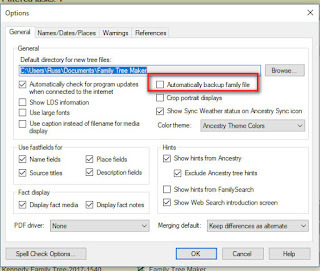 After you navigate to where the file is, like the list of folders above, we are given an option to Link To or Copy the file, into Family Tree Maker. I ALWAYS use the COPY option. I do what for two reasons: 1) If something happens to either the original or the copy, I have a Back Up Copy of that Media file. If I do any editing of that Media file in Family Tree Maker, as an example, I have that Original Copy it the Genealogy Folder elsewhere on my computer, 2) when I Back Up my Family Tree Make FILE, the Media Folder, and all of the Media files in that folder are Backed Up, along with the Data (names, dates, places, facts, citations). REMINDER: In Family Tree Maker, Media Workspace, that the CATEGORIES serve the same purpose as the Sub-Folders do in File Explorer. 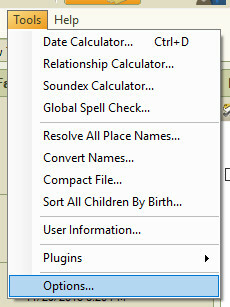 Now for the different types of Back Up files in Family Tree Maker, the Automatic and the Manual. Both types of these Back Up files have the File Extension of FTMB. (bit confusing, until you look at the rest of the filename. Is the Automatic Back Up option. What that means is that every time you close down the file (File, Close, is the RECOMMENDED way to do so), the program will create an Automatic Back Up. The important thing to mention here is that it ONLY Backs Up the DATA in that File. No images are included in this type of FTMB file. This is important to remember IF you have a computer crash and the only thing you did was an Automatic Back Up, and IF it was backed up on an External Drive or "In the cloud" (or OneDrive, Dropbox), the Media files are NOT included in that FTMB file. If you do a File, EXPORT, for a choice other than GEDCOM, it Too will generate a FTMB file, but WILL include the Media files. The Manual Back Up option, there are TWO types of Manual Back Ups. 1) when you compact the file, and 2) from the File menu. 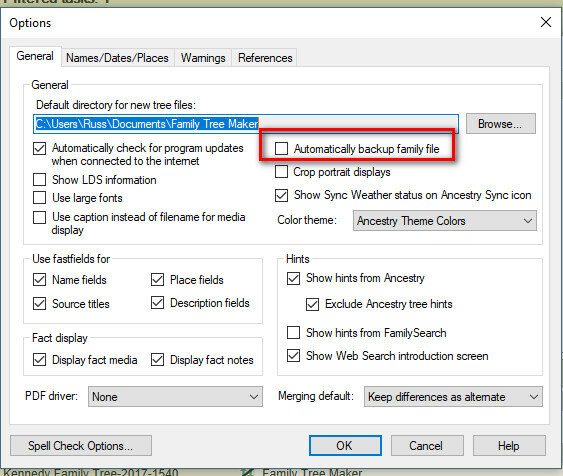 Selecting the Backup file before compacting will cause Family Tree Maker to Back Up the file, before it Compacts and performs the extended analysis of the file. An aside on this, that you have a BACK UP before the analysis begins, What IF there is a serious issue within the file and makes that file so that it can't be opened. This Back Up can be sent to the Support folks at Family Tree Maker to resolve, just provide them with the detatils. I ALWAYS use the Compact AND Back Up option. The difference here is that ALL of the "Copied" files, in the Media Folder for that file, are included in that Back Up. That Manually created back up can be taken to another computer, put on a flash drive and ALL of the Media and Data are in ONE FTMB file. For this blog post, I am not going into the other options in the Manual Back Up process, like allow the Back Up to include the Syncing with an Ancestry Member Tree. Look at the file SIZE difference AND that the Date is added. Family Tree Maker includes the DATE of the Back Up, in the Manual version. I modify the filename to include the TIME (at the end). I may make several back ups in a given day and want to be able to tell the difference. There is also a Back Up option in the File Menu. 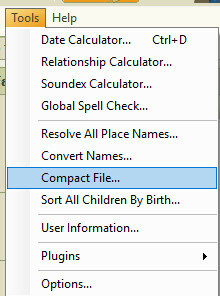 That allows you to select, as does the Compact and Back Up option, what to include in that Back Up. I use the "Custom Directory" Option, and direct that Back Ups to an External Drive.